He began playing the game as a boy, eventually working his way up through junior hockey before getting drafted by the New York Islanders in 1991. 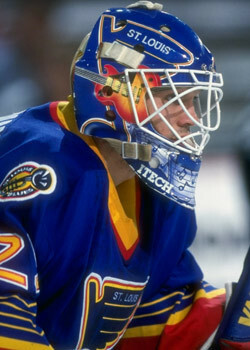 After a two-and-a-half year stint in the minors, McLennan was called up to back up Ron Hextall and played 56 games before the Blues signed him as a free agent in 1996. With the Blues, McLennan claimed the Bill Masterton Trophy, given each year to the NHL player that best displays perseverance and dedication to the game. Just before signing in St. Louis, he fell ill with a serious case of bacterial meningitis that left him in intensive care for a week. McLennan regained his strength, getting back into game shape and eventually backing up his childhood hero in Fuhr in St. Louis. In three seasons with the Blues, McLennan played in 82 games, posting a 38-27-8 record with a 2.17 goals-against average and a .899 save percentage. "I loved St. Louis. It’s such a sports city," McLennan said. "We had such a terrific fan base that helped us to have success at home all the time, so we felt like we could win every night. "We had great teams. Fuhr was a Hall-of-Famer, literally, a legendary goaltender. I was fortunate to play with really four or five legends there when you think about it: (Brett) Hull, (Al) MacInnis, (Chris) Pronger, (Pierre) Turgeon, (Pavol) Demitra, all real quality players. The Blues had a wealth of talent and was a class organization from top to bottom." McLennan would finish his NHL career with the Calgary Flames. He played in 254 NHL games, registering 80 wins, 109 losses and 33 ties. He had 13 shutouts and a 2.68 goals-against average. After hanging up his skates, he served in three different capacities for the Flames: Director of Goaltender Development, a professional scout and an assistant coach under then-head coach Brent Sutter. "When you’re in a dressing room and you retire and you head into coaching, you’re still friends with a lot of the guys in the room and you kinda have to draw a line," McLennan said about the transition to coaching. "I didn’t have problems with it, but when times were tough and you lose some games, your emotions get the best of you. It was challenging, but I loved it. The closest thing to being on the team was coaching the team." When McLennan’s contract option as an assistant coach wasn’t renewed, he welcomed an opportunity to try some TV work for TSN in Canada. The experience led to a position as an analyst for NHL Network, where he currently works today. You can find him often on NHL On the Fly and NHL Tonight, both of which are flagship programs for NHL Network. He describes his new role as exciting, as on-air talent spends time in a war-room of sorts, watching games from around the League, taking notes and making plans for what to discuss on the air. "You literally watch the games, mark down points, look at goals and have people help you create that show. You’re jumping into games live. ‘Jeez, what a great hit, what a great save by Halak.’ At the end of the night for the NHL Tonight show, you’ll pick up the best things from the game and focus on it. "There’s a lot of work that goes into it, but it’s an amazing process and there’s a lot of great people at the NHL Network." As he prepares for another season as a network analyst, he also tries to balance what's becoming a busy personal life. He’s looking into buying a new house, he’s engaged to be married in a year and he has his first child on the way. But the man they call 'Noodles' (because he made his own pasta on the minor-league bus rides because he didn't want to eat bad diner food before games), has never strayed too far from the game that he says has been very good to him. "When you look at it, I was fortunate to play a game that I loved and grew up loving. It’s given me a lot and I want to give back to it, obviously," McLennan said. "I’m proud of the game and I’m proud of the guys. The one thing that I’ll always cherish is the friendships I’ve made in this game. That’s what’s special about hockey.